Lent is a period of fasting, prayer and almsgiving. It was an immediate period to prepare for baptism on Easter vigil. The constitution on Sacred Liturgy, ‘Sacrosanctum Concilium’, says two important issues connected with the Lenten season are the Catechumunate leading to Baptism and the Public Penance. They are no more, but their spirit is reflected in the season in the liturgy. The right idea of Lent is available in the Lenten prefaces. It is a time to prepare for Easter, to celebrate the paschal mystery. One can do it in a best way, by loving God and serving the neighbour, The Church suggests many practices/devotions during the Lent. Besides prayer and fasting, one of the popular devotions that practiced during the Lent is the Way of the Cross (Via Crucis), also called as the stations of the Cross. The Way of the Cross originated in pilgrimages to Jerusalem and a desire to reproduce the Via Dolorosa (sorrowful way). After the seige of 1187, Jerusalem fell to the forces of Saladin, the first sultan of Egypt and Syria. Forty years later Franciscans were allowed back into the Holy Land. Saint Francis of Assisi, founder of the Franciscans held the Passion of Christ in special veneration and is said to have been the first person to receive stigmata. In 1217, St. Francis also founded the Custody of the Holy Land to guard and promote the devotion to holy places. Their efforts were recognized when Franciscans were officially proclaimed custodians of holy places by Pope Clement VI in 1342. During the 15th and 16th centuries the Franciscans began to build a series of outdoor shrines in Europe during 15th and 16th Centuries, to duplicate their counterparts in the Holy Land. The number of station were between 7 and 13, seven was common. These were usually placed, often in small buildings, along the approach to a church. In 1686, in answer to the request, Pope Innocent XI permitted Franciscans the right to erect stations within their churches. In 1731, Pope Clement XII extended to all churches the right to have the stations, provided that a Franciscan father erected them, with the consent of the local bishop. At the same time the number was fixed at fourteen. In 1857, the bishops of England were allowed to erect the stations by themselves, without the intervention of a Franciscan priest, and in 1862 this right was extended to bishops throughout the church. So till today we have 14 stations (traditional) of the Cross. Out of the 14 traditional stations of the cross, only eight have clear scriptural foundation, Pope John Paul II introduced a new form, the scriptural Way of the Cross on Good Friday 1991 and performed them at the Coliseum in Rome on Good Fridays during his reign. The devotion, highly recommended by the Church, was developed during the Crusades when the knights and pilgrims began to follow the route of Christ's way to Calvary. The Stations of the Cross became an important catechetical tool, and the popularity of this devotion inspired many to follow Jesus very closely. It is through the acknowledging that the Stations of the Cross provides a needed element in the path to spiritual life for Christians. It is also known as the Stations of the Cross, are a way to pray and meditate on Christ's sacrifice for us. The Stations of the Cross are representations of the path Jesus bore on his way to the crucifixion. They involve Jesus enduring suffering, insults, moments of support, and relay the intense sacrifice that Christians believe Jesus undertook for human salvation. The Stations of the Cross provide a type of meditation or reflection about individuals. It is divided into fourteen stations from the time He was condemned to his burial. This devotion has been long encouraged by the church, and is especially useful during Lent and Good Friday. 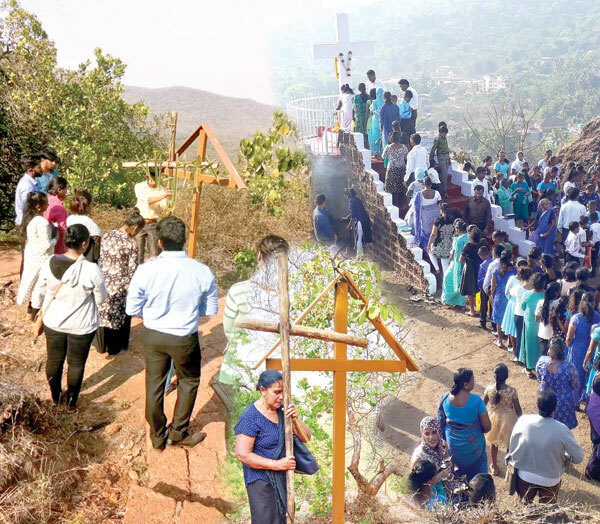 Way of the Cross is also a popular devotion in Goa. Every Friday of the Lent, each parish/chapel will have a way of the Cross (traditional). As Jesus walked the way of the Cross, faithful are encouraged to walk from one station to another Large number of faithful including, children, youth, elderly men and women participate in the Way of the Cross contemplating on the passion of Christ. Apart from the churches/chapels, faithful also walk the stations of the cross in their own small Christian Communities (house to house). Some parishes has a tradition to walk a long distance way of the cross, once in a Lent season to a hilliock. Stations of the Cross are also acted out especially on Good Friday. I could see during my Lenten preaching in the churches, the prayerful atmosphere during the way of the cross. Faithful are fully engrossed into the reflections of the cross. The Church has always kept alive the memory of the words and the events of the last days of Jesus Christ. A loving although painful memory of the path Jesus walked from the Mount of Olives to the Mount of Calvary. The Church knows in fact that in every event which happened on that Way lies hidden a mystery of grace, a gesture of his love for her. Devotion should lead us to Christ, strengthening our relationships with him. We need to understand the real meaning of the devotion. Participating in the way of the cross, should help us introspect our lives as his disciple. This being, a pious devotion connected with the Passion of Christ, it should conclude, however, in such fashion as to leave the faithful with a sense of expectation of the resurrection in faith and hope.